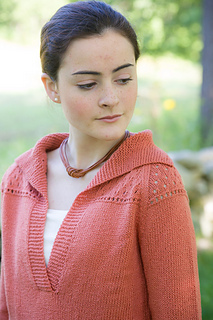 A collared raglan pullover in stockinette with eyelets and garter stitch edges and collar. XS (S, M, M/L, L). Shown in size S.
Knitting needles in sizes US 4 and 6 (3.5 and 4 mm) or size to obtain gauge. 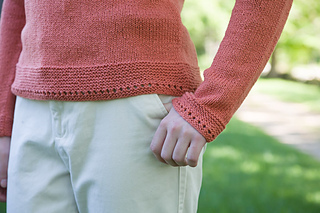 21 sts and 32 rows = 4” in St st using larger needles; 20½ sts and 32 rows = 4” in Eyelet patt using larger needles. Take time to save time, check your gauge.